My final three boas of the year are now on order, and part paid for. First up is an Anery Male, to pair inthe first instance with one of the Hypo Anery females, which I hope to collect today. In early July I should pick up a T+ Nic. I plan on slowly increasing the number and quality of my Nicaraguan Boas. They are easy to work with, and remain small, which, while space in the Shed remains at a premium, is important. And finally, a Male Hypo Jungle, being the result of a Jungle crossed with a Sunset. This will give me all sorts of breeding possibilities from 2014 onwards. I have spent a little more (OK, a lot more) than I had planned this year on new stock, but I think my son and I now have a good basis for a varied and interesting breeding programme. This year we will be limited to a Blonde Albino/ Sharp Albino, a Hog and a Salmon Pastel, and one pair of Kenyan Sand Boas. As it is our first year breeding, there are bound to be a few mistakes, but we hope to learn from these, and put what we have learnt into practice in the second year, 2013. 2014 is the year that we would hope that most of our 2011 females will be ready to start breeding. We have the Jungle, several Salmons, and the Stripe Boa, as well as the 2010 Hogs and Nicaraguans. Although I tried to resist the temptation of buying another Boa this weekend, I failed miserably, picking up a 2011 female DM Stripe Boa. She is a very attractive, very friendly snake. She is still quite small, compared to my other 2011 snakes, but that is no bad thing, as space in the Shed is beginning to become a bit problematic. I am quite excited at the breeding possibilities of the Stripe line, possibly with my son’s Coral Albino or his Salmon. I plan on keeping my eyes out for a male to add into the programme at some point, particularly as we seem to be a little female-heavy at the moment. I acquired three more 2011 female Boas today. Two are Salmon 66% Kahl Albino (parents are from Gazboas) and one is a Salmon Kubstch Pastel. Pictures will follow shortly, assuming we ever get any decent weather to take photos in. Quite apart from being beautiful snakes, they are a useful addition to our collection. They are a dwarf boa, so will keep relatively small. Initially one will be bred with Leonard, our male 2010 Nic. One will will be bred to Jim, our Male Hog Island Boa. We have a Sharp Albino male in our collection, as well as two male common boas, and a T + Blonde Albino, but, having worried at first about not having enough females, now probably need one or two additional males. We have a few in our sights, but will have to wait and see. Hopefully my son will be obtaining a 2010 male Coral Albino at the weekend. The shed is beginning to look a little crowded! 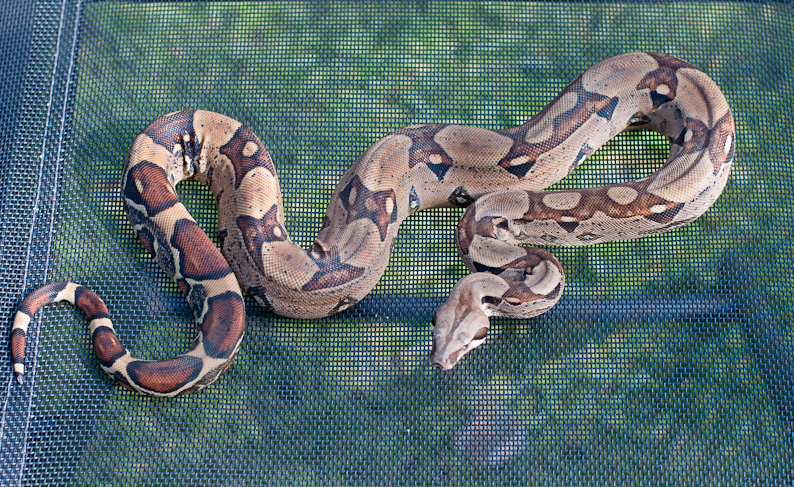 We have just acquired a 2010 female Jungle Boa, possibly het for sharp. 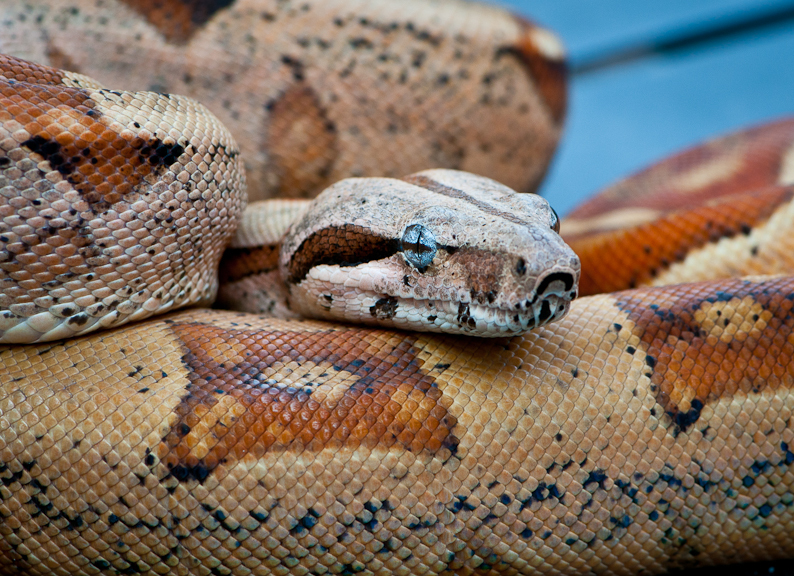 She is a beautiful boa, with very clear markings, and we are looking forward to breeding her from 2013 onwards. I had hoped to take some new photographs of the whole collection over the Jubilee Weekend, but it was too cold and wet to get them out. I also need to get a different set in which to photograph them. The most recent pictures have been around a garden chair, and it would be nice to get some variety. I am on the lookout for a small tree without too many leaves, and which will not grow. Perhaps a trip down Columbia Road flower market will provide the answer. I also hope to get into the studio for some snake related portraits before the end of June.